Well then, it’s a fair time since I updated this homepage and a lot has been happening. I’ve spent much of the time since the “Painting with Sound” exhibition at the Barony Centre, simply painting and trying to catch up with all the paperwork that needed to be done! Over this period a number of exhibition opportunities have arisen and so the main focus of this new blog is to tell you about these shows. As you may know, I have over the past few years, shown some of my paintings at the fabulous Biscuit Factory in Newcastle upon Tyne. Back in the spring the gallery once again contacted me and asked if I’d like to show some more work with them, this time in their Autumn 2018 exhibition. I of course accepted and during the summer have been working on several new pieces specifically for this show. One of them is this new 80 x 80cm acrylic and pastel painting based on a walk we did in Sutherland back in May. The hill, Meallan a’ Chuail, is quite rugged and although only 750m, is a far more interesting summit than its slightly bigger neighbour, Beinn Leoid ….which was originally our target. It really was an enjoyable and quite exhilarating day and we had the hill to ourselves. Even as we made our way up the ridge, I was thinking about how I might make a painting and I had started it within a few weeks of returning home to Irvine. As an aside, the folk at the Biscuit Factory have also asked me to give a short talk about my work and in particular, about how I have in recent years, started to use sound alongside paint. Sound engineers, Graham Byron and Drew Kirkland who I have been working with now for several years, will be travelling with me to Newcastle to set up and exhibit the Kylesku Project, our first audio painting, so that people who attend the talk will also get the opportunity to experience this new more immersive form of landscape. This event is planned for Sunday October 14th at 2pm. For further information and to book a ticket, please contact the Biscuit Factory. Earlier in the summer I was also asked whether I would like to put half a dozen small paintings into a group exhibition at the Moray Arts Centre, for a few weeks in September. It’s a long way to travel but I kind of figured that we could make the trips to deliver and collect the work, into wee short walking trips …..taking the gear and the tent with us and then heading for the Cairngorms. That was the plan anyway, but just three weeks ago I heard that the three other people taking part in the show, had pulled out for various reasons ….and I was asked if I’d put a small solo exhibition on instead. After a short time thinking about this and checking what work I had available, I agreed. Nita and I did a flying visit about ten days ago to see the centre and to get an idea of the space and after a mad week sorting and wrapping the work, we went back on Monday to hang the show. We were very lucky in this as Graham and Tracy Byron kindly offered to drive up and help is with the installation. This made for a very enjoyable and stress free few hours. The show looks good I think and hopefully we’ll get a good few visitors during the course of the exhibition. Of course, with a car full of paintings, there was no room for the rucksacks and so no walking …but hey, you can’t have everything! I was also recently invited to show a couple of small paintings in the Seagull Gallery in Gourock. The gallery has a rolling and constantly changing exhibition and there is a wonderful variety of work on display. For us living here in Irvine, it is just under an hour long drive up the coast and so made a very pleasant wee trip out when we went to deliver the paintings. We are once again holding a group exhibition of work created by the artists working at the Courtyard Studios in Irvine. The exhibition which will contain work by 17 artists, will include paintings, drawings, prints, jewellery, hand bookbinding, ceramics, leatherwork, photography and textiles……so something for everyone to enjoy. Things have been such a rush for me recently that I’m still not entirely sure which pieces I’ll be showing in this show! I have a new 80 x 80cm painting completed and another on the go ….so maybe one of these. I’m also working on a new large graphite drawing and so this might be a candidate if I get it finished in time. Courtyard Studios Open Weekend – Saturday / Sunday 6 / 7th October, 12 noon – 5pm both days. This will, I think, be the 14th year running that we’ve held this event and it’s proved quite a success over the years. It’s a great opportunity to catch everyone in their studios at the same time and to see all the new work that has been done over the preceding 12 months. Many of us have been working at the Courtyard for a good number of years, but artists come and go and this year we have three new tenants and so there will be completely new work to see in their studios. As usual, everyone is welcome and of course, being right on the Harbourside, there are many and varied places to eat and drink during your visit. 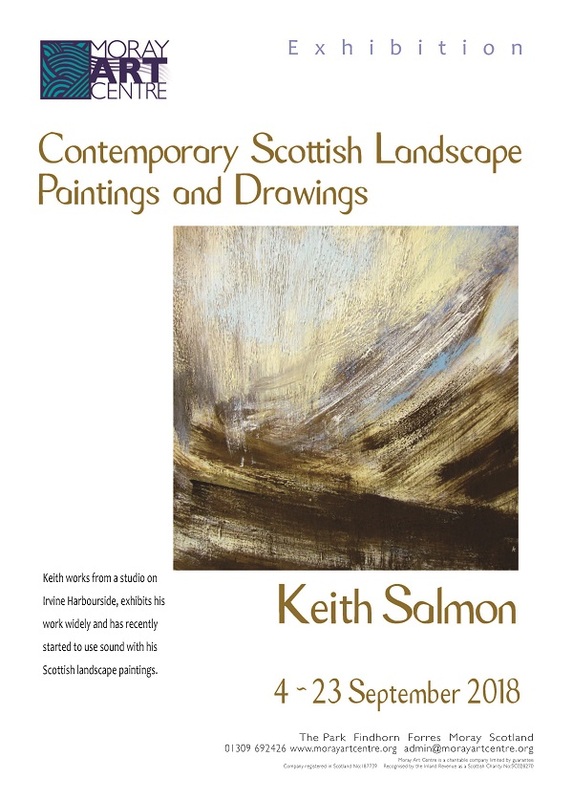 As well as a big selection of paintings and drawings on show in my studio, I will also be exhibiting and playing the Kylesku audio painting again ….so if you missed seeing and hearing it at the Barony Centre back in March, you’ll be able to catch it as part of this event. Well, that’s about it for now. I do hope that you can get along to one or other of these events.